Registry Number - Coming Soon! This exquisite model is the latest version of the refit Enterprise as seen in the Star Trek movies 1-6. 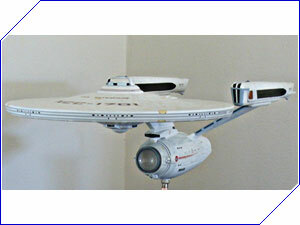 It is a new 2005 release by Polar Lights and is the largest licensed scale Star Trek model ever produced. It is 3 feet long and has a saucer diameter of 16 inches. This model can be built up as either the refit 1701 version as seen in the Star Trek movies 1-3 or one of the newer 1701-A versions as seen in movies 4-6. It comes with an optional lit shuttlebay/cargobay interior, VIP lounge, and an arboretum. Due to the model's size and superb detail, it will only be offered as a fully lit build. It will be painted with the full Aztec paneling in authentic pearlecent paint coats along with accurate color schemes. This model will be built with accurately blinking strobe lights and navigation lights, as well as the unique spotlights shown in the movies.